Disclaimer: The information on this page is intended for individuals who have been medically diagnosed with Medial Epicondylitis. If you suspect that you have Medial Epicondylitis then it is important to visit a qualified medical professional in order to rule out any other possible causes prior to considering any advice or treatment option. Did you answer yes to any one of the above questions? If you did then the OSMO Patch could well be one of the most significant decisions that you may make towards becoming free from pain in the elbow TODAY. The OSMO Patch is completely natural and used in conjunction with proper rest is ideal for relieving the swelling and inflammation associated pain due to golfers elbow / medial epicondyltis. Let us first begin by getting a better understanding of golf elbow, including exactly what is golf elbow, the causes of golf elbow, symptoms of golf elbow and what the best treatment for golf elbow is. Golf elbow is an extremely painful inflammatory condition which involves the inner side of the forearm and elbow. The technical name for golf elbow is ‘medial epicondylitis’ and although the injury is common in individuals who play golf, the fact is that anyone can develop this condition. Golf elbow (medial epicondylitis) is defined as an overuse injury which develops from damage (small micro tears) to the tendon that attaches to the bony bump on the inner-side of the elbow (medial epicondyle). This inflamed tendon attaches the muscle on the underside of the forearm which controls the closing curling of the wrist inwards, hence why pain may radiate up the inner forearm. Golf elbow (i.e. medial epicondylitis) is due to repeated stresses that overtime cause the formation of minute micro tears & scars in the tendon which attach to the inner side of the elbow. Incorrect technique during sports such as golf which can place the elbow joint under strain. Jobs that require repetitive movement in the arms. Placing regular heavy loads on the muscles and joints of the arms. Age related wear & tear of the tendons. Pain on the inner elbow joint. Pain when gripping or bending inwards. Decreased strength in the arm and weakened grip. On the other hand you may just prefer to use a 100% natural treatment for your golf elbow. The OSMO Patch is a great natural choice for supporting the relief of inflammation, swelling and pain in the your elbow and aiding your golf elbow to begin to heal. 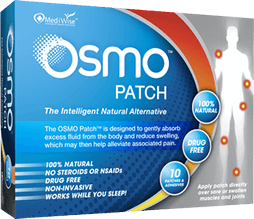 The OSMO Patch has been specially designed to draw fluid from the body and reduce swelling, inflammation & associated pain. It is simply stuck over the affected area before going to sleep where it can then go to work reducing inflammation and stimulating blood flow continually throughout the night. When you wake up in the morning simply remove and discard the used patch. This process is then repeated each night as required. So if you are ready for a natural & effective approach to supporting the relief of swelling, inflammation and pain due to golfers elbow then the OSMO Patch is the Answer!